Since working out / lifting weights is taking up a lot of my time lately, this post is a little tardy. It seems like I’m always either lifting or in recovery mode. I am up to moving almost 83,000 lbs. of weight now (I have no frame of reference if that is good or not). But I digress. . . I made this for Easter which was like months and months ago. Better late than never and all that jazz and whatnot. 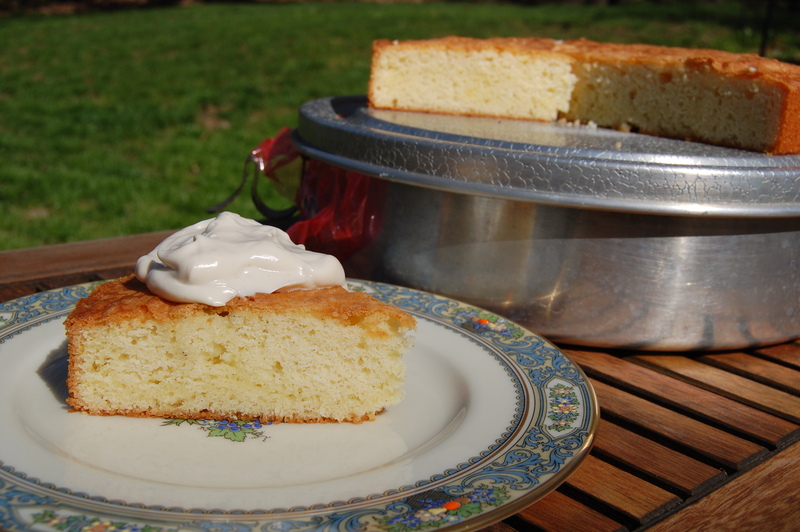 Again, continuing on my spotlight on Chef Eve Aronoff, here’s her recipe for a Lemon Sour Cream Cake. 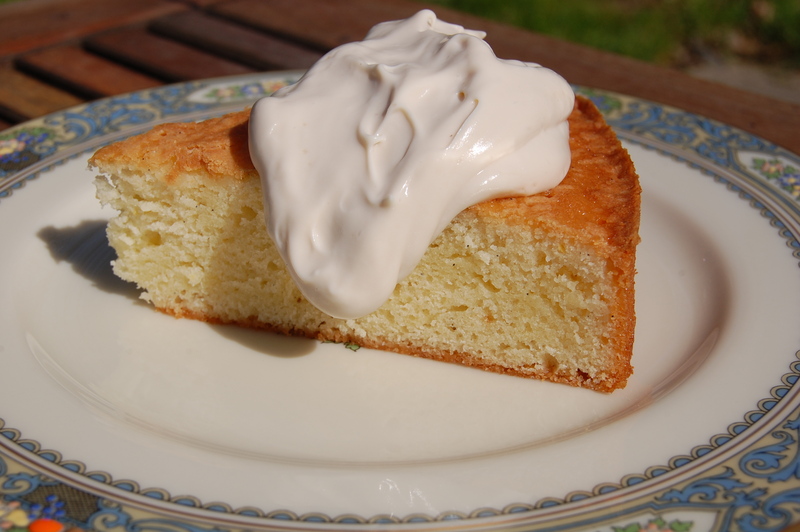 This recipe (taken from her cookbook eve: Contemporary Cuisine, Méthode Traditionnelle) is a little bit different from cakes that I usually make. First of all, there’s a higher egg content than I’m used to. Secondly, there’s a higher sugar content than I’m used to. Sure, I could have combined those two sentences into one, but I like numbers. I luv the little flecks of vanilla in there. Some might want a more uniform color. If so, use the vanilla extract like in the original recipe. 1. Preheat oven to 350 degrees F. Butter and flour the cake pans. Sift together flour, baking soda, and salt. Set aside. 2. In the bowl of a large electric mixer, cream the butter. Add vanilla and gradually add the sugar. Beat until fluffy. 3. Add eggs, two at a time, beating until thoroughly incorporated after each addition, and for a couple of minutes after the last addition. Scrape the sides down to keep the ingredients well mixed. 4. On the lowest speed, add half of the dry ingredients, then all of the sour cream and lemon juice and zest. Finish adding the rest of the dry ingredients, again scraping the sides and beating until smooth. Do not overmix or the cake will get tight. 5. Pour into the pans. Level off by rotating the pans briskly back and forth several times. Bake for about 1 hour for an 8-inch cake, 30-45 minutes for a 4 1/2-inch cake, and about 20-30 minutes for 1-cup muffin pans, or until the cake springs back upon touch. 6. Cool cake in the pan for about 15 minutes. Then remove by running a thin knife around the edge of the pan. Invert the cake onto a rack and turn onto another rack to cool completely. Notes — Eve likes to garnish this with some sliced ripe seasonal fruit, some lemon curd, or some brown sugar cream. . . I made up my own version of a simple brown sugar cream which just involves some vanilla extract, brown sugar, and sour cream. It’s all to taste so no exact measurements here. Just make sure that the brown sugar is dissolved into the sour cream. I use this for things like zucchini bread or carrot cake. . . Don’t forget to like Jereme’s Kitchen or Daisy Cakes on Facebook! 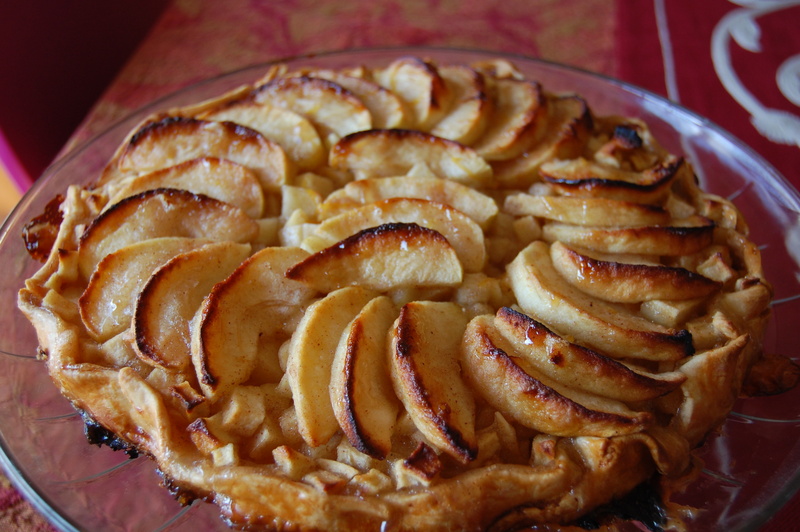 This entry was posted in Cakes, Desserts, Holidays, Recipe and tagged Cakes, Eve Aronoff, Food, Holidays, Recipes. Yummy looking cake. I love specks of real vanilla bean in anything! That is SOO awesome of you regarding the lifting!! Are you doing a program? met with a trainer once to come up with a program. we’ll see how long i can stick to it! Beautiful cake. Wait, when I wrote that I got a serious case of deja vu! Yum! I love lemon cakes! Goes in the “to try” file. My favourite cake flavours, bar none. Congrats on the workout regimen! Thanks for liking my Pomme Frites blog. Lemme know if you’d like to swap links. I’m working on my blogroll now. Add me to yours and I’ll reciprocate. Thanks!